Electric lighting was the wonder of the 1880s. In a land dependent upon shimmering candles or dim gas flames to cast a fluttering, hazy light over a small space, the ability of arc lights to brightly illuminate a large area was astounding. And a Wolverhampton firm was in the forefront of this technological breakthrough. It was Elwell-Parker of Commercial Road which would develop into one the most important manufacturing concerns in the town - the Electric Construction Company. That it did so owed much to the inventive genius of Thomas Parker, one of its partners. Thomas Parker in middle age. Courtesy of Gail Tudor. In June 1888, a Manchester newspaper reported that "electric lighting is rapidly establishing itself as a valuable illuminating example". This had been made clear the previous evening at the Royal Botanical Gardens in Old Trafford where the great improvements which had been made "were shown by what was undoubtedly a fine display of electric arc lighting", which lit up the whole of the grounds. A total of 56 arc lamps had been supplied by Edison and Swan, the business set up just five years before by the pioneering and inventive Thomas Edison of the USA and Joseph Swan of England. However the dynamos had been especially made by Elwell-Parker. There were two machines which were "shunt wound', each of which was capable of working 40 arc lamps. Slow-speed machines, they ran at 700 revolutions per minute. It was a notable achievement for a company that had only been founded in 1884 but it was one of a number of remarkable successes. In January 1886 it was reported that 380 incandescent lamps had been installed throughout the Swan Garden Ironworks of Messrs John Lysaght in Wolverhampton. The current for them was generated by two Elwell-Parker dynamos which were driven at 95 revolutions per minute by an ordinary high pressure horizontal engine. A pair of similar dynamos had also been supplied to the Monmore Ironworks of E. T. Wright and Sons and at George Wilkinson's Sheet Mill at Tividale. 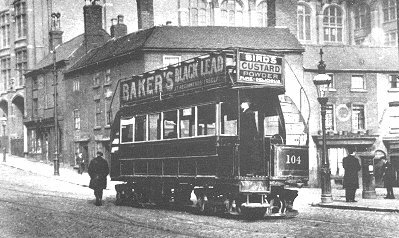 By now, Elwell-Parker had laid down the electrical plant for the Blackpool Tramway, one of the earliest examples of electric traction in the world. Then in late 1888, and at the behest of Birmingham Corporation and the Birmingham Tramway Company, the Wolverhampton firm played a crucial role in the trials of an electric motor for tramcar propulsion in Birmingham. The motor was made by Elwell Parker under a patent from a Belgian company, but the necessary dynamo machine and accumulators were manufactured according to the firm's own patents. These trials led to the construction of the Birmingham and Bournbrook Electric Tramway. Earlier that year the Wolverhampton business had received a large order for dynamos, exciters, secondary generators, regulators, metres, and other equipment from a new company in South Kensington that aimed to replace gas lighting with that of electric. It was explained in a Sheffield newspaper that the orders were valued at many thousands of pounds and that other orders were expected quickly. Indeed "the works are very busy, running day and night". One of the accumulator-powered Birmingham trams. The rapid growth of Elwell-Parker arose from its innovative and quality products arising from the mind of the extraordinary Thomas Parker. The son of a moulder in Coalbrookdale, he had been nine when he had started work at the foundry where his father was employed. He later recalled that he arrived at 5.30 in the morning "to light the fires, and so prepare for the men. Sixty hours and more was the week's work . . . Life was hard at the works. If a boy did not quickly do what was ordered, he would often receive a kicking from his superior." From an early age, though, Thomas Parker was determined to educate himself by attending evening classes, whilst he also showed an aptitude for making things. After becoming a moulder, he went to work in Birmingham. The embodiment of a self-improving working-class man, he attended the Church of the Saviour of the acclaimed preacher George Dawson and went to lectures at the Birmingham and Midland Institute. Following his marriage to his wife, Jane, and like many another highly-skilled men, Thomas tramped the country seeking better employment opportunities. After a time in the Potteries, he went to Manchester, where he also attended science lectures at Hulme Town Hall. These were to have a positive impact on his life. Thence he went to Dudley and finally in 1867 he returned to Abraham Darby's Works at Coalbrookdale as a foreman in the engineering section. Now aged 24, he was rapidly promoted to take charge of the chemical department and electro-depositing. According to a local newspaper it was here that "his faculty for invention asserted itself". In 1877 he and Philip Weston, a machinist at Coalbrookdale, patented improvements in direct acting steam pumps and steam engines - for which they were later awarded a medal at the Inventions Exhibition. 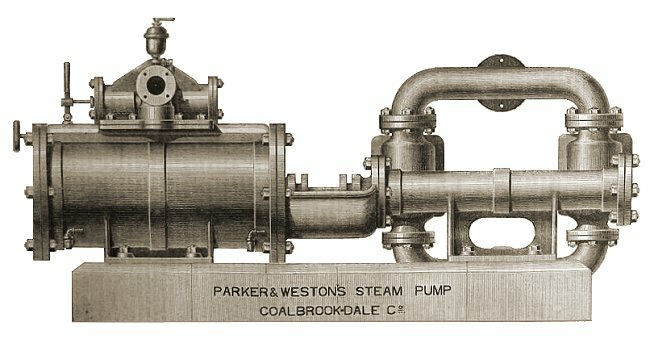 A Parker and Weston steam pump. Two years later, Thomas designed and built a dynamo for the electro-plating department at Coalbrookdale and he went on to invent the open Kyrle grate and the Robinson gas engine for Tangye's of Smethwick. But henceforth it was electricity which gained the attention of his quick and talented mind. By 1882 Thomas was on the management of the engineering portion of the foundry and that year he gave a lecture in which he demonstrated Edison incandescent lamps. The source for the current was secondary batteries made by Parker. In their manufacture he had "discovered and utilised the important point of the great value of concentrated nitric acid in facilitating the formation of the necessary oxide". He applied for a patent for this discovery at the same time as Garton Plante and the patent was divided between them. That year, Parker also became involved with Paul Bedford Elwell of the Patent Tip and Horseshoe Company in Commercial Road, Wolverhampton and next to the Crown Nail Company. Elwell had been educated at King's College, London, where he had obtained a distinction in mathematics, and he had studied coal mining and iron manufacturing in northern France. He also had an inventive bent and had taken out patents for venetian blinds and nail making machinery. Together Elwell and Parker patented an improved lead-acid accumulator and improvements in dynamos and electric lighting apparatus. At the end of 1882, Parker moved to Wolverhampton and the two men joined forces. With 100 people working in Elwell's operation making nails and horseshoes, Parker started his side of things with one of his sons and one man. At first they built accumulators but early the next year they made a dynamo. Parker himself thought it was a 'waster', but it was bought by a representative of the Edison and Swan Company of Manchester who had visited the works. After some attention on site by Parker, it was successful in coating calico printing rollers with nickel. The inventor remembered that he received a £40 and a testimonial. He was encouraged to build a dynamo for lighting, and "this was a success, and got us an order for six. We received from the Manchester Edison Company of that time, £1,000 in advance for building dynamos: this was the beginning of Elwell-Parker, and of dynamo manufacturing at Wolverhampton." This business developed rapidly and in December 1884 the company of Elwell-Parker Ltd was formed with a capital of £50,000. Interestingly the move gained more attention in the Manchester newspapers. This was because of the connection with Edison and Swan and because all seven subscribers were Manchester men. Parker was now gaining considerable notice and acclaim. In 1885 he was made a member of the Institution of Electrical Engineers and was praised in the Royal Society of Arts Journal for leading the way in developing the electricity industry in Britain. His ingenuity was highlighted two years later when he developed a cheaper process to extract phosphorus and chlorate of soda by electrolysis. By now, Paul Bedford Elwell had left for Paris to prepare plans for its underground electric railway but Parker continued to direct the growth of the Wolverhampton company. In 1889 he was made a member of the Institute of Civil Engineers, whilst Elwell-Parker Ltd, which now employed 400 people, was taken over by the Electric Construction Corporation Ltd. Parker was appointed engineer and manager and under his supervision an impressive new factory at Bushbury was designed, laid out and constructed. This included a large electrical 'Erecting Shop' which housed two tracks running 30 ton cranes. Parker went on to direct numerous "very large installations in connection with electric traction, including the Liverpool Overhead Railway and the overhead system of the electric traction in South Staffordshire". The installation of electrical lighting in Oxford was also designed by Parker and this 'Oxford System' was adopted by other towns. In 1894, Parker ended his association with the ECC and set up Thomas Parker Ltd to manufacturing plant for electric lighting, electric transmission of power, electric railways, electric tramways, and electro-chemical and electro-metallurgical purposes amongst other things. The three other directors were Charles Tertius Mander, the Mayor of Wolverhampton; Thomas Graham, the proprietor of the 'Express & Star'; and William Thomas, a manufacturer. A 1905 advert from 'The Electrical Review'. Production was at a new works on the Wednesfield Road. The company was awarded a gold medal for high-speed railway motors at the International Exhibition in Brussels in 1897. That year Parker's initiative led to the formation of the Midland Electric Corporation to distribute electricity in South Staffordshire. It was the first company to get statutory powers to distribute electricity over such a wide area. A power station was built at Ocker Hill with sub-stations at Bilston, Brierley Hill, Darlaston, Old Hill, Tipton and Wednesbury. 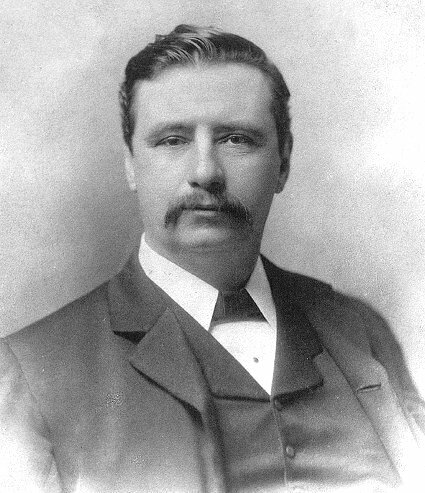 In 1899 Parker stepped down as managing director of Thomas Parker Ltd. However, he remained on the board and as consulting engineer until 1904 when he moved to London, where he was consulting engineer to the Metropolitan Railway Company. As such he was responsible for the design and construction of its first electric engine. When he died in December 1915, Thomas Parker was acclaimed as a pioneer of electrical railways and as one of those responsible for the progress made in electrical science in the latter part of the nineteenth century. 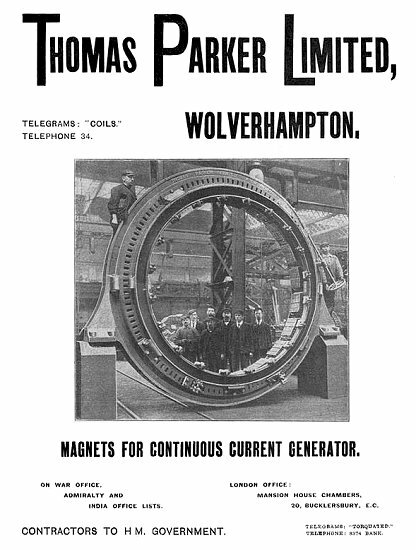 As for the Wolverhampton companies with which he had been associated, unfortunately it seemed that there was not enough business nationally for two large electrical engineering firms to prosper in one town and in 1909 Thomas Parker Ltd was wound up. The Electric Construction Corporation had also struggled after a bright start. 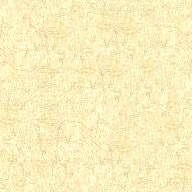 In 1893 it too had been wound up, but fortunately it was reconstituted as the Electric Construction Company. It then prospered. During the 1930s and 40s its main production was in rotating electrical machinery, switch and control gear, static transformers, and rectifiers; and by the 1960s it was also manufacturing and installing many of the power station generator systems in the UK. By this decade the firm boasted several factories in Wolverhampton and abroad. Locally, a control gear factory had been built at Shaw Road, by the main works; whilst the associate companies of E.C.C. Moulded Breakers Limited and Federal Electric Limited had been set up in Fordhouse Road, Bushbury. These made a complete range of medium voltage switchgear for use in electrical distribution in industry, hospitals, shops and houses. In the late 1970s a policy decision was made to concentrate all the production effort onto the range of Brushless A.C. Generators and the 'Automatic Voltage Regulation' system. These generators were produced in large quantity and supplied worldwide to diesel set manufacturers such as Lister, Blackstones, and Petter but in 1983, despite efforts to redesign the machine, which unfortunately lacked capitalisation, cost effective competition began eating into the market. Employing about 2,300 people at its peak, E.C.C. was of massive importance to the economic well-being of Wolverhampton, but by the end of the 1960s it was beginning to face problems. In particular, cheaper foreign products, some of them subsidised by governments, had an adverse effect upon sales. These problems mounted and sadly the E.C.C. factory at Showell Road, Bushbury was closed in 1985 and 800 people lost their livelihoods. It is a pity that today, too few realise the importance of this site and of Wolverhampton to the emergence and development of electrical engineering.